Those docs are at it again. Still toying with life after death, doctors Herbert West (Jeffrey Combs) and Dan Cain (Bruce Abbott) are looking to further their research and not only reanimate death bodies, but to actually create life from a number of parts. Fleeing from a civil war in South America where they have been since the events of the first movie, they have now set up home in a caretakers house next to a cemetery. There they can work in peace, or so they think. As now there are two flies in the ointment. One is Dr. Graves (Mel Stewart) who has been toying with the re-agent that was left behind after the hospital massacre in part one. Second is Lt. Leslie Chapman (Claude Earl Jones), who has his own reasons for wanting to find out what Herbert West and Dan Cain are up to. 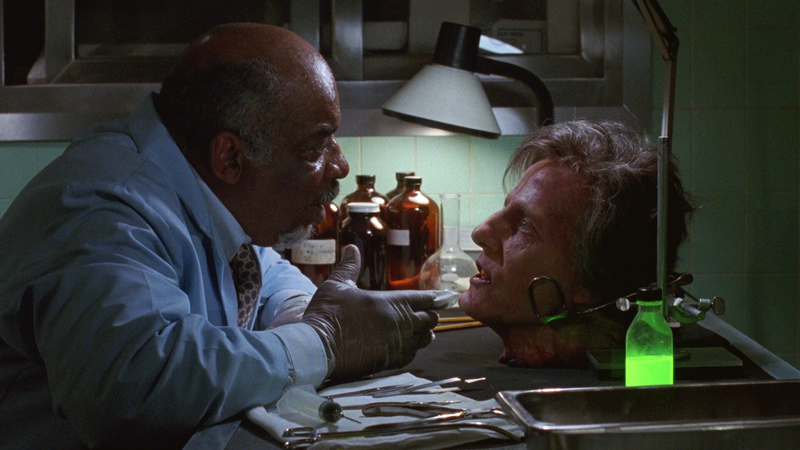 Bride of Re-Animator also sees the return of Dr. Hill (David Gale), or his head at least. After being reanimated by Dr. Graves, Dr. Hill tells him he wants revenge on Herbert West. Dr. West and Dr. Cain however are solely concentrated on bringing together body parts, to give life. However it will not be as easy as they hope, all leading to a bloody showdown with Dr. Hill and his assortment of freaks. This for me was a weaker movie than the first. It just took too long to get going in my book, and resulted in everything been thrown at the wall towards the end, hoping something would stick. I lay blame at Brian Yuzna, who I just don’t rate at all as a director. For me this series should have always been directed by Stuart Gordon, who just seems to understand the material better. 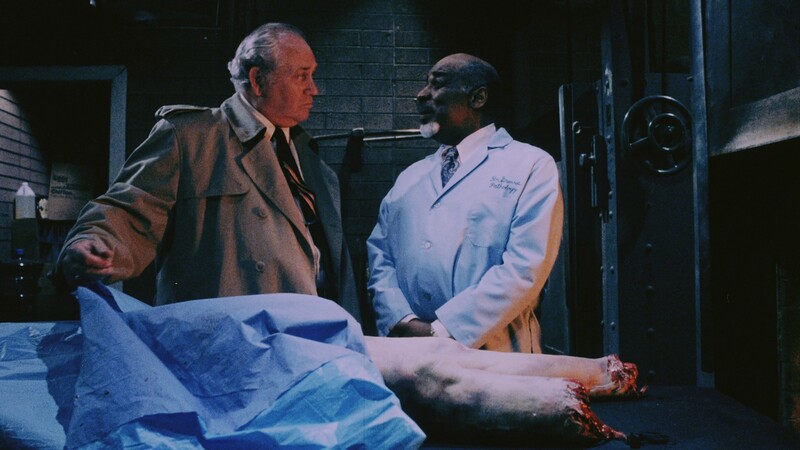 Although this is a weak sequel, the worst in the series is Beyond Re-Animator, which is part 3. That film is also directed by Yuzna, having Spain double for America. This film is not terrible, but in comparison to the first movie it is clearly inferior. There is some great gore and some funny moments with mischievous reanimated body parts. I would say it’s worth a watch if you have a few mates round as I’m sure you’d enjoy it. As always Jeffrey Combs is always worth watching, he just gives his all in whatever role he is in. This is a movie that wastes no time whatsoever in getting off the starting block. It immediately begins with Thunderbolt (Clint Eastwood) dressed as a church minister delivering a sermon. Suddenly a strange man walks into the church and begins to open fire on Thunderbolt. 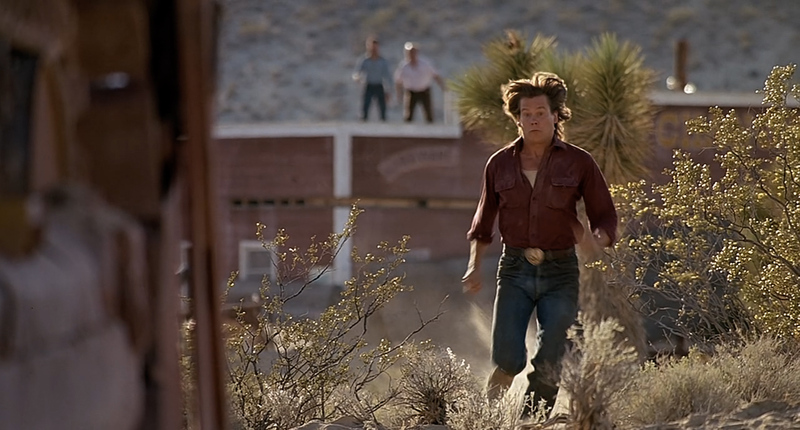 Thunderbolt runs for his life when he is almost knocked over by Lightfoot (Jeff Bridges), who has just stolen a car off a lot. Thunderbolt hitches a ride and the two slowly become friends. However two men from Thunderbolt’s past want to find him, believing he stole from them. Red Leary (George Kennedy) and Eddie Goody (Geoffrey Lewis) have a score to settle with Thunderbolt. When the two men catch up to Thunderbolt and Lightfoot, they learn of the truth to the heist that Thunderbolt carried out many years prior. 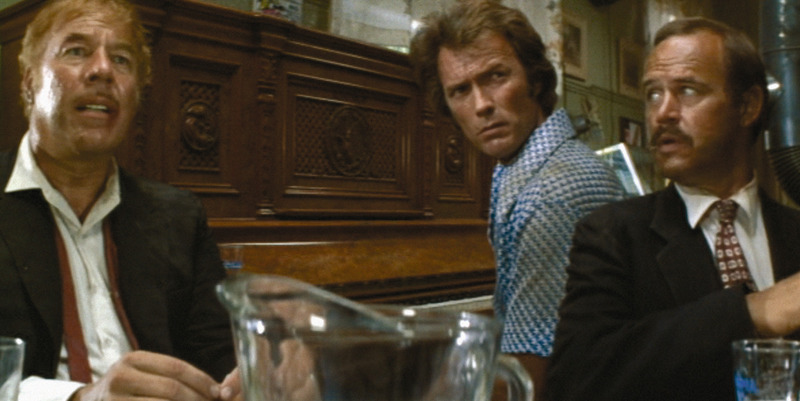 Together the four men decide to carry out a new heist on a security deposit vault, though the animosity that Red feels for Lightfoot threatens to throw the whole plan into disarray. The plan is very elaborate, but to get the money needed the men must find jobs to finance it. This for me is where I felt the film kind of slowed down. It was a monotonous section, that almost felt like what a real job would feel like…boring. However it doesn’t last long. The plan even involves Lightfoot in drag, forcing Jeff Bridges to show a little leg, which to be fair to the guy doesn’t look half bad. To say any more would spoil what I felt was a great final third. The chemistry between the two leads is great, and you can tell they enjoyed themselves whilst filming. The support from George Kennedy as the volatile Red Leary is brilliant. He really does let rip with his short temper and is a menacing presence. Geoffrey Lewis is also funny as the slightly simple Eddie Goody, just looking to impress Red. The film is directed by Michael Cimino, and was his first feature before he directed ‘The Deer Hunter’ four years later. Cimino was a director that never really delivered after ‘The Deer Hunter’, with ‘Year of the Dragon’ and ‘The Sicilian’ being disappointments. He does well in his first directorial role here however, also serving as the writer too with what isn’t too bad a script. I would recommend this, as it’s definitely worth a watch. This copy of the film was graciously provided by the kind folks at http://www.secondsightfilms.co.uk. 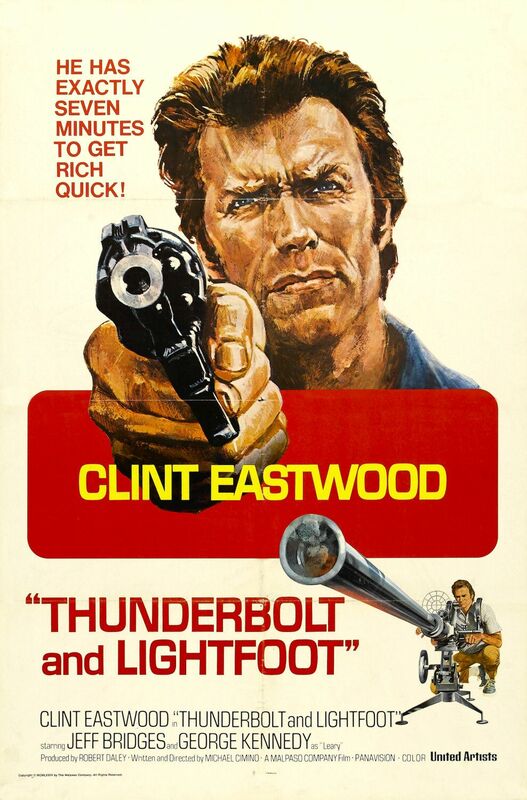 Thunderbolt and Lightfoot is released on 23rd June and is available now for pre-order. Hi guys, JM here. First of all let me take this opportunity to thank all you wonderful readers and visitors to this blog. Without you it would not be the popular place it is today. You guys are the reason I do this. I take so much pleasure in reviewing movies for you, including ones you may have missed. I am truly fortunate to have such a great group follow me. Now I’d like to give you the opportunity to suggest movies for me to review. You can leave a comment at the end of this post and I will endeavour to watch the film and do a review, should it be one I haven’t already seen. If I’ve seen it I will happily review it. 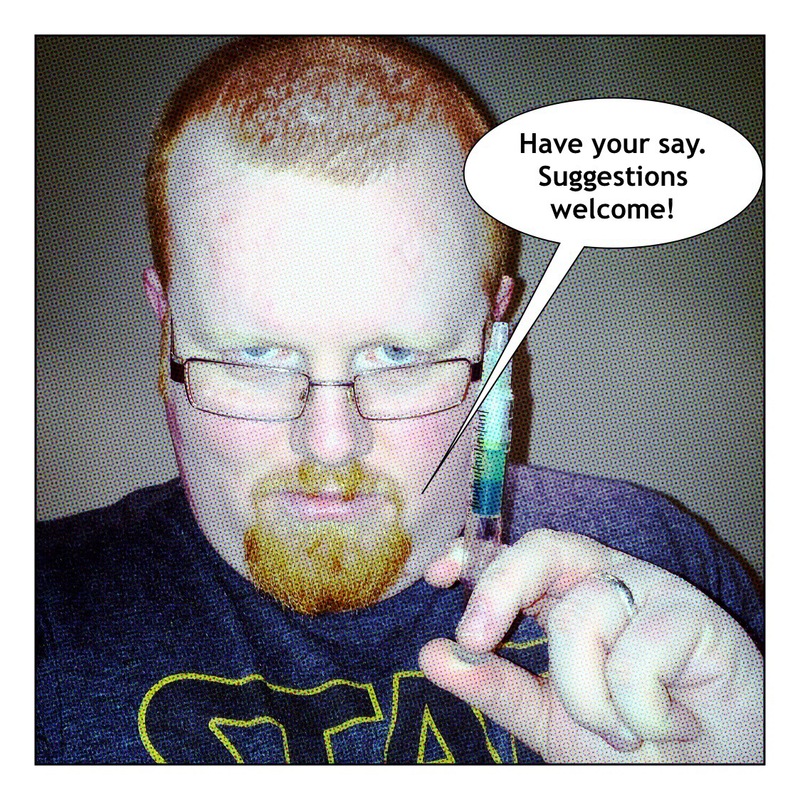 I can’t promise I’ll get round to every suggestion as I also have prior commitments, but I promise I’ll do my best. Once again, thank you so much. I hope you’ll continue on this journey with me. Val (Kevin Bacon) and Earl (Fred Ward) are two handy men who live in the small, quiet town of Perfection. They get by doing odd jobs, but after one nasty accident involving sewage, they decide it’s time to move on to pastures new. However something is under the ground, something large and very hungry. When people begin to disappear or are found dead, Val and Earl begin to investigate what exactly is going on. Together with seismologist Rhonda (Finn Carter), they discover that there are large, subterranean worms living underground. These large worms can detect the smallest sound and have decided to call the town of Perfection their hunting ground. 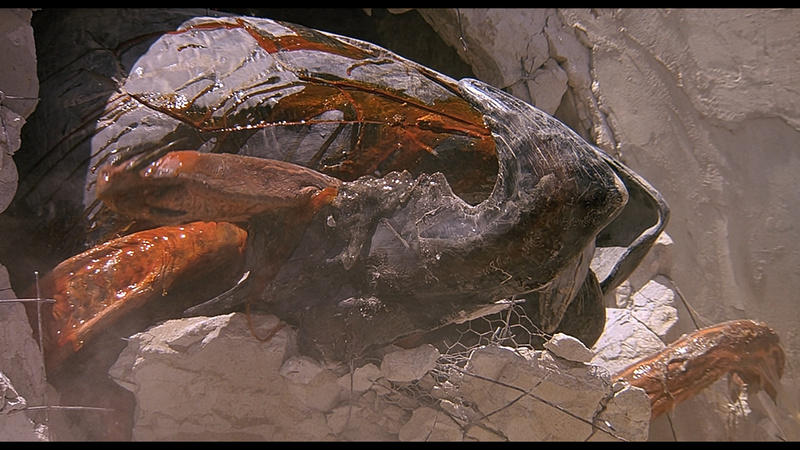 Realising that trying to escape is out of the question, the townsfolk decide to tackle these worms, or Graboids as Walter (Victor Wong) calls them. Together with local gun nut Burt (Michael Gross) and his wife Heather (Reba McIntire), Val and Earl begin to formulate a plan on distracting and dispatching the deadly threat. This for me, is one of my all time favourite movies. It has everything. Action, comedy, horror, some excellent lines and is just an all out joy to watch. I have seen this many times since it’s release and it never gets old. 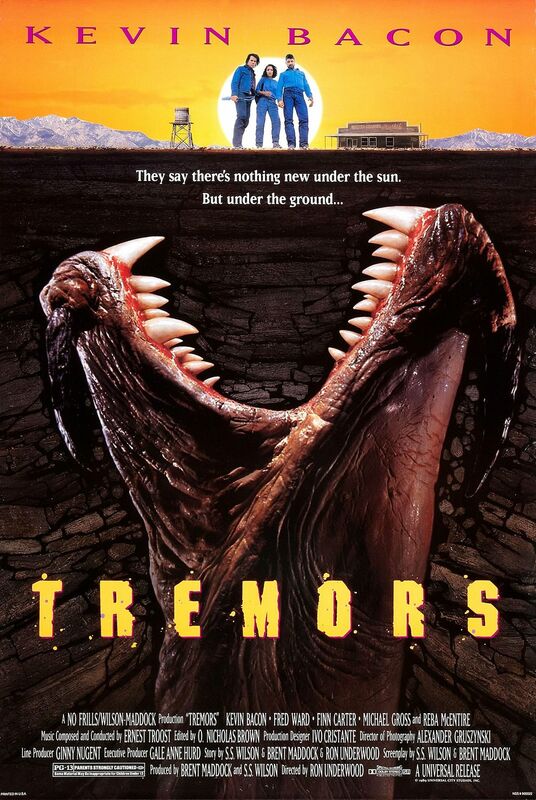 The sequel (Tremors 2) was also worth watching, and I will do a review of that in due course. 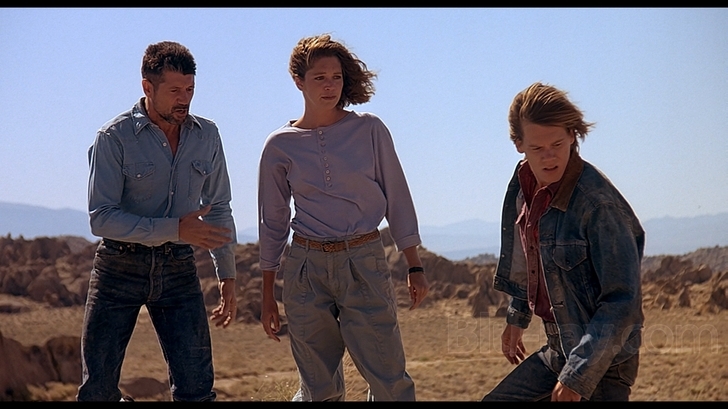 However I would say to steer clear of Tremors 3 & 4 as they are dire. For me this is one of Kevin Bacon’s best roles. He brings warmth and heart to a role that would have probably just been a one dimensional hick in the hands of a lesser actor. Fred Ward is also hilarious as the gruff Earl Bassett. You can see there was some great chemistry between him and Kevin Bacon as it really shines through in the film. 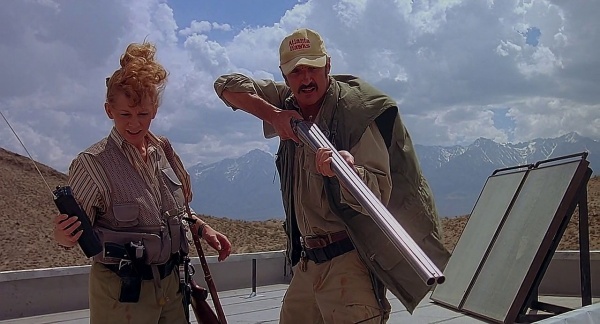 I also loved Michael Gross as the gun obsessed Burt Gummer, however I wish he had of given up the role after Tremors 2 as he really just phones it in in the later sequels and subsequent TV series. Like I said it’s one of my absolute favourite movies, and is definitely worth a watch. If you have never seen it then you owe it to yourself as a film fan to get it and watch it. It is a classic in every sense of the word and is perfect entertainment for a Saturday night with a drink and some popcorn. Seriously, get it. Five friends are travelling along the back roads of America looking for tourist spots to hang out at and enjoy. After one friend goes missing whilst looking for a spare wheel to replace a flat, the other four friends get in a car and go look for him. As they’re driving they come across a small hidden oasis on private property. Mr. Slausen (Chuck Connors) who owns the land the oasis is on, finds them and asks where they have come from. He invites them into his home, telling them they can wait there while he helps repair their car. Mr. Slausen also runs a roadside museum, full of an assortment of wax dummies. He tells the group that he used to run it with his brother who left long ago to make dummies for some of the bigger companies. He asks that while he goes with one of the group, Jerry (Jon Van Ness), that the girls don’t wander off and poke around the property. Which is just about the time things take a turn for the worse. 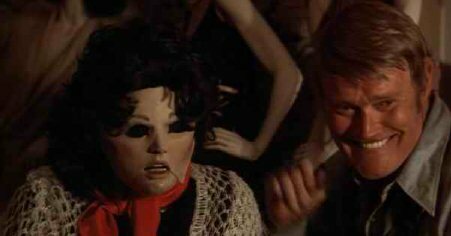 A masked maniac with what appears to be telepathic powers, begins to stalk the girls, slowly making them apart of the roadside attraction. This is the sort of movie killer that just happens to always be in two places at once, whatever could it mean? Yes that was sarcasm. This is a dire movie by all accounts. Chuck Connors is good as the elderly farmer Mr. Slausen, but the rest of the cast really just can’t act. 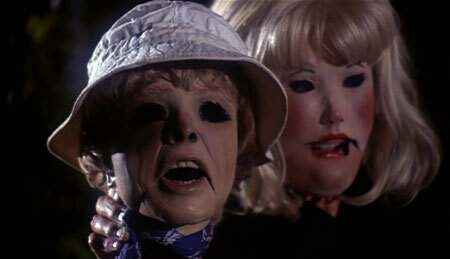 The opening 10 minutes of the film was creepy I will admit, but it rapidly goes downhill from there. The voice of the ‘killer’ is just ridiculous, and jettisons any hint of fear or menace the killer may have brought to the film. Going the Michael Myers/Halloween route and keeping the killer silent would, in my opinion, have been the better way to go. As with all these films, the scantily clad ladies are all dispatched in variously gruesome ways, but as a viewer you really don’t care. I did hear that the blu ray version is actually five minutes shorter than all the other versions, due to some underhanded tactics by Charles Band and the group at Full Moon. That said, I really fail to see how an extra five minutes of footage would make this abysmal film any better. One for the bargain bin I feel. 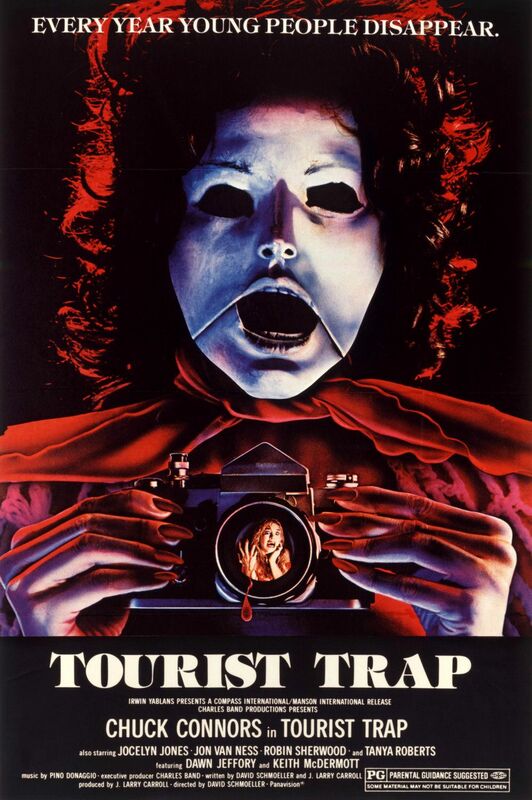 This copy of Tourist Trap was kindly provided by the very kind folks over at http://www.88films.co.uk.